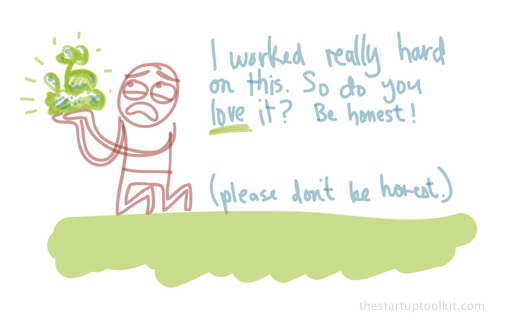 When you’re testing the waters with a new idea, you really need to present yourself as emotionally robust. You can’t validate a business if you seem pathetic, which I’m using in the sense of “having a capacity to move one to compassionate pity.” You tick this box if one person’s feedback will significantly affect your mood. Lots of people want to help make your business better, but they also don’t want to feel guilty or deal with messy emotions. If it seems like negative feedback might make you sad, you’re going to get a load of false positives. False positives lead to wasted years of hard work. Avoiding them is a priority. Some people are naturally avoid this problem. Entrepreneurs who have already had an exit usually have less at risk, both financially and emotionally, so they attract more honest criticism. I’m sure you’ve seen unusually harsh criticism justified by saying “he can take it.” If you need that criticism in order to be successful, then it behooves you to figure out how to look like you can “take it”. Sal Virani encourages negative feedback to an unbelievable degree. After his events he brings everyone over to a “wall of criticism” that he has already seeded himself with half a dozen complaints about the event he just ran. He is so excited to get criticism (even legitimately hurtful stuff) that he receives far more learning opportunities than most people. The early steps of customer development act as a hack to get around the pathos problem. Instead of asking whether your product solves a problem, you ask what their problems are. Instead of asking what they would pay you, you ask them how much they pay for the current solution. You remove yourself from the line of questioning so there’s no opportunity for them to hurt your feelings.